The European standard EN 12953, drawn up subsequently to the Pressure Equipment Directive, stipulated permissible firing heat outputs per fire tube for large waterspace boilers that go considerably beyond the previously applicable rate pursuant to TRD [Technical Rules for Steam Boilers]. 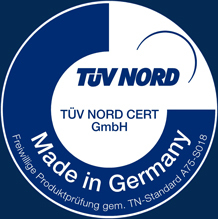 Operators and manufacturers of large waterspace boilers in Germany and other countries have acted upon this and have since equipped a large number of plants with large waterspace boilers that achieve individual outputs in the double fire tube range of up to approximately 35 MW or 54 t/h steam under the new conditions. 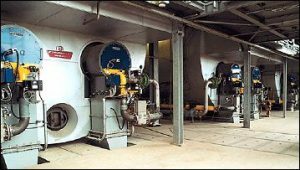 VKK STANDARDKESSEL set up one of the first plants with large waterspace boilers of this performance capacity in Germany, which generates 200 t/h of superheated steam with four STANDARD CONDORBOILERs.